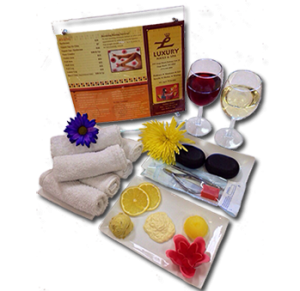 At Luxury Nails & Spa, we equipped with latex sanitary equipment and our implements and pedicure bowls are sanitized according to Missouri State Board regulations.We also give new buffer, tile for each customer’s manicure and pedicure. Complete filing and shaping of finger nails conditioning of the cuticle, hand & arm massage, plus a paraffin wax, hot steam towels and finish with your choice of polish. LUXURY NAILS deluxe spa pedicure comes in four different scents. You may choose one of the following: tropical citrus & lemon, cucumber & lavender. This spa comes with soak in warm water and sea spa. Cuticle work and callus treatment are done with exfoliation scrub in sugar. Finished off with foot mask, hot towel and paraffin wax, hot stone are used in massage reflexology. This treatment will penetrate deeply into the muscles, melting away layer of tension and stress. Enjoy your glass of house wine while you relax. Check out our complete service menu and price list to get a feel for what we do.